Share charters are a good option for singles or couples on a budget. In some places these are called party boats or group charters or there is a way to “join a group” or buy a “spot” on a boat but here in Kona it’s just known as a share charter. There are only a few operations in Kona that are even capable of regularly putting a shared charter together because a certain number of people are needed for a share charter to even take place. Some boats offer share charters but have so few customers that they have little to no chance of making a share charter actually happen. There is absolutely no cheaper way for 2 people to go fishing for a full day than this!!! *You can initiate a share charter on any available day (email or call me). 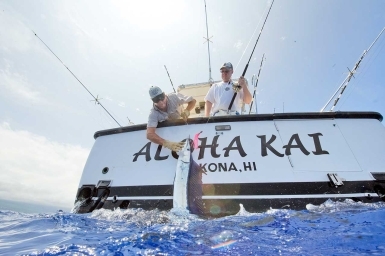 * 1 or 2 people book 1/2 of the Aloha Kai for a full day share charter (never more than 2). * The available share date will be listed below. * When the other 1/2 of the share is completed by 1 or 2 others (never more than 2), the date below will disappear. * The cost for 1/2 of the boat (1 or 2 doesn’t matter) is $375 + 7% Hawaii excise and Harbor tax. * If by chance a share is not reached by the date of your charter, we will still go fishing. You can stay with a full day charter at full exclusive charter price (2X the above price) or you can reduce your charter down to a 3/4 day exclusive to save money. I put this share program in place because for years, I had two people fishing with me (at full price) and during our trip, said that they wouldn’t have minded being able to share the boat with one or two other people but there was never anything in place to make that happen until now. Since I started the program, I have had people ask me right away what my cancellation policy is. In other words, they wanted to initiate a share charter but if it looked like it wouldn’t get completed, they intended on canceling the trip. If that’s what you’re thinking, don’t even bother initiating a share. Just keep checking this page to see if someone else initiates a share charter during your stay in Kona. Email (that’s best) Jeff@FISHinKONA.com or call 808-895-1852 (No texting please) for reservation instructions. If you can, have my web site open when you call and please don’t ask if you could be allowed to break the “ never more than 2″ rule and bring an extra person. No. Here are the dates of open shares that have been initiated and waiting for someone to book the other 1/2 of the Aloha Kai. Please don’t ask me if I have an open share day that is not listed below. The answer is “No, I do not”. May 6th share charter available. June 25th share charter available. Dec. 27th share charter available. YOU can initiate a full day share charter on any date that I have open for a charter. The earlier you start the share process, the better chance there is of making a completed share charter happen. Last year 92% of the shares were completed.